COMPOSOLITE® is an advanced composite building panel system suitable for major load bearing structural applications. The system combines manufacturing simplicity with an almost unlimited number of configurations. The modular construction system consists of six interlocking components. The main component is a 3″ thick x 24″ wide open-ribbed building panel. 3-way and 45° connectors allow the system components to turn corners and facilitate the joining of walls or sides. Toggles lock panels and connectors together securely. For added flexibility, the system also includes a hanger and an end cap. For permanent structures, joints between panels and connectors are bonded during assembly. This uniquely designed system of interlocking components makes it possible to design fiberglass structures for a broad range of construction applications with an almost unlimited number of configurations. COMPOSOLITE® is available in standard polyester (green), polyester fire retardant (gray) or vinyl ester fire retardant (beige) resin systems. The standard fire retardant resins meet the requirements of Class 1 rating of 25 or less per ASTM E-84 and the self-extinguishing requirements of ASTM D-635. The resin mixture contains a UV inhibitor and the composite includes a surface veil on all exposed surfaces for enhanced corrosion and UV protection. Other resins and colors are available upon request. COMPOSOLITE® is available in a polyester resin (Strongwell PE) and vinyl ester resin (Strongwell VE) which is certified to NSF-61. DURASHIELD® is a tongue-and-groove fiberglass pultruded panel comprised of a pultruded skin over a foam core. The pultruded fiberglass skin is available in either an isophthalic polyester or vinyl ester resin. Both resin systems are flame retardant (UL94 VO). Vinyl ester is utilized in more corrosive applications. A synthetic surfacing veil is incorporated into the skin to improve weathering, corrosion resistance and resistance to degradation from ultraviolet rays. Resistance to weathering can be further enhanced by the application of a polyurethane paint. The core material is rigid closed-cell urethane foam. The foam core provides an insulation “R” factor of 7 for the 1″ panel and 21 for the 3″ panel. DURASHIELD® panels are available in 1″ x 12″ and 3″ x 24″ sizes. The panels can be produced in any length that is practical. Typical lengths would be in the 12′ to 32′ range. DURASHIELD HC® is a cost-effective alternative to DURASHIELD® because the building panel has a hollow-core. The panel is a sensible choice for any type of roofing, flooring, enclosures or screening that does not require insulation. It is a custom designed tongue-and-groove building panel for quick assembly and easy installation in various applications. The pultruded panel’s unique hollow core and intermediate ribs provide extra stiffness for uses such as decking, cladding or tank covers. The panels can be bonded together with standard adhesives and attached to structural shapes with bolts or screw fasteners. These standard polyester panels will not rot, rust or mildew, which makes them ideal for high moisture environments including saltwater. A synthetic veil is incorporated into the surface to improve weathering, corrosion and UV resistance. The standard resin system of DURASHIELD HC® is polyester; however, it can be custom ordered with a vinyl ester resin for highly corrosive applications. Both resin systems include flame retardants and meet the requirements of a Class 1 flame spread per ASTM E84 and the self-extinguishing requirements of ASTM D-635. 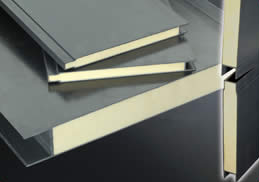 The panel weighs 3.27lbs/linear ft.
DURASHIELD HC® is available in standard 1″ x 12″ panels. The panels can be produced in any length that is practical. 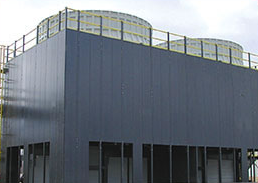 DURASHIELD® and DURASHIELD HC® panels are made for use with EXTREN® line of structural shapes. EXTREN® is available in more than 100 standard shapes. Supporting fiberglass structural shapes are available for section/base, corner connections, roof joiners, door framing and window louvers.